If you’re setting healthcare marketing strategy, it’s either an incredibly exciting time or an incredibly exasperating one. Where you stand depends on the extent to which your healthcare brand—your health system or hospital—is articulating and demonstrating value in the midst of the dramatic changes taking place across the healthcare landscape. Are you offering solutions that attract consumers to your brand? Are you keeping them interested and involved and less vulnerable to copying by competitors? Here we offer insider tips for creating a successful healthcare marketing strategy, including how to keep your message fresh and relevant, characteristics of a winning brand, a look at successful websites actively engaging the very customers you want, the new medium of podcasts, and how to become a long-term success story. We not only explain these tips but also give you specific ways how you can work them into your own strategy. At the basis of any solid brand is solid healthcare marketing strategy, and with these tools, you can rocket your brand to the next level. Healthcare Marketing: Are you fresh and relevant? Your health system or hospital story doesn’t matter. What matters is simply how your story fits into your customers’ lives. Embracing this idea is important to your success as a healthcare marketer. It’s the difference between being fresh and relevant or getting lost in a BIG sea of easy-to-ignore, seen-and-heard-it-before, same-as-everyone-else noise. The big sea, of course, is the 5,000 other marketing messages that hit the average American—hence your audience—in the 10 hours a day or so they spend with various media. For the best of brands, it’s an epic battle to get consumers to stop and take notice, much less to care. For health system and hospital brands, they have to work even harder. Because let’s face it, in a world of retail, fashion, technology, entertainment, and consumer brands, you’re like the kid in gym class who always gets picked toward the bottom by the two assigned captains in dodgeball. But it doesn’t have to be this way. Every health system or hospital brand deserves to climb higher on “the relevant brands roster” list. Every healthcare brand deserves to tell, and demonstrate, a great healthcare marketing story. Here’s the thing: To help your brand improve and grow its standing, you need to help your customers improve and grow. And the more you’re in touch with their larger story, the more you create a brand story that they want to be a part of. You can even take this a step further – don’t tell people a story; give them a story to tell. This success formula cuts across all industries. And the common theme is marketing that leads with a customer problem or aspiration, acknowledges their unmet needs and opportunities, and then uniquely communicates and boldly delivers their solution. It’s marketing that empathizes, connects, and inspires. Said another way, it’s marketing that matters. Because it’s relevant to a customer’s life. How can healthcare marketers create more meaningful and relevant engagement with customers who are now at the center of the health-care ecosystem? These customers are proactively taking ownership of their health, taking control of the buyer journey, and taking control of the media they want to see. AND, how do you do this when the size of your wallet might not be as big as the behemoth health system the next county over? Hop on over to our article on Strategic Healthcare Marketing for the answers – Health Care Marketing: The Recipe For Cooking Up Fresh and Relevant Results. Want to talk about how to make your marketing matter more? Give us a call at 973-292-1400 or reach out here. The Meaningful Brand Index—a global metric of brand strength—recently reported that most people wouldn’t care if 70% of brands disappeared overnight. This means that 70% of all brands are perceived to be meaningless. At Trajectory, we believe that eight habits (characteristics and behaviors) will separate the momentum brands from the laggards. When applied as a complete framework, they can help you to grow stronger customers, brands, and business. Besides being fresh and relevant and establishing yourself as a momentum brand, you also need to fully understand your audience and how they consume information in order for your healthcare marketing strategy to be truly successful. And believe it or not, understanding websites they frequently visit will enable you to understand your consumer better. Sure, finding and engaging your healthcare consumers at their “zero moment of truth” is your daily mission as a marketer, but you know that discovering where they are online is meaningless unless you have an idea of what brought them there. That means that understanding the kind of content that healthcare consumers are interacting with before and after selecting a healthcare provider is a top priority. We’ve compiled a list of the most popular wellness-related websites as well as the topics that consumers cared about most to include in your consumer healthcare marketing. 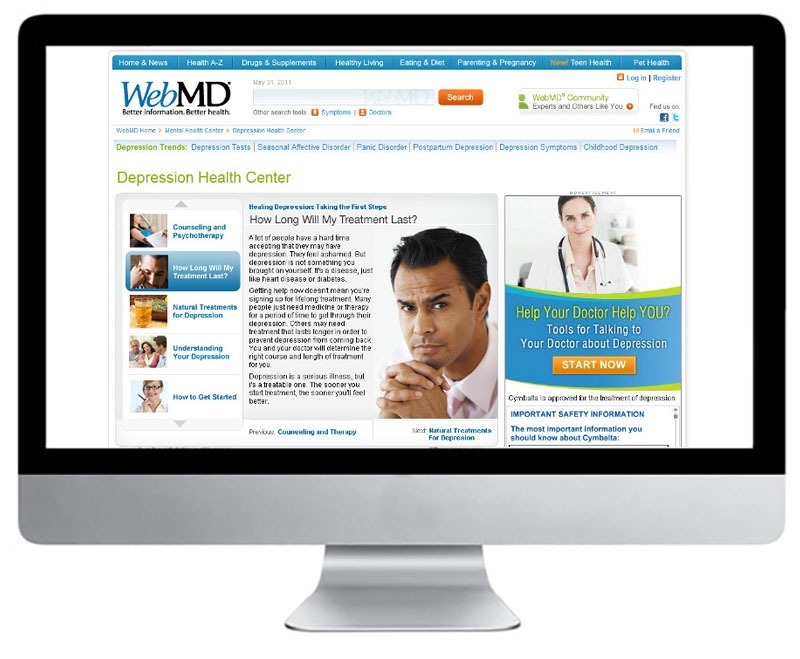 Web MD is the undisputed leader of the pack, with 80 million+ monthly visitors. 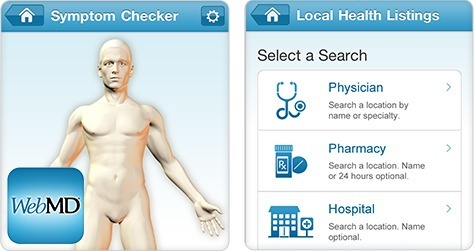 Its core appeal is its search tool for healthcare consumers seeking information on symptoms before they decide to see a doctor. In addition to its interactive, graphical symptom checker, the site provides a wealth of user-friendly reference articles that give consumers the option to dig deeper into the science behind their medical concerns. Last year, the most popular searches by healthcare consumers included medication safety and side effects, the costs of anti-allergy tools such as the Epi-Pen, and food safety. This year, the emphasis has heavily been news-driven, with searches on cancer (relating to news of a well-known politician’s diagnosis) and lyme-disease prevention topping the list. Rounding out trending topics were skin infections, heart health, meningitis, and substance abuse. Consumers are actively researching the potential signs of major illness as well as health issues highlighted in current affairs. We also saw many top trending articles about wellness and longevity, from ways to maintain heart health over time to nutritional guidelines to promote mental wellness during the aging process. Healthcare consumers are looking for “explainers” covering both sides of difficult medical questions, comprehensive symptom checkers, and actionable health insights that are presented with engaging, detailed visuals. 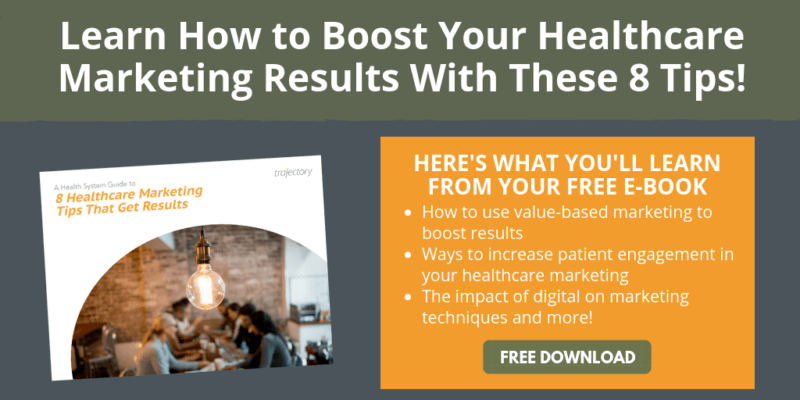 Create healthcare content marketing with a reservoir of bite-sized health facts that consumers can easily skim and then click through to find more complete information on medical symptoms. Place a floating button that offers a “talk to us” option at each digital touchpoint. This call-to-action button should allow your consumer to instantly book an appointment, launch a live chat, or access content that highlights your health system’s role as an immediately available resource to answer their medical questions (such as an informative video that automatically presents a link to book an appointment). 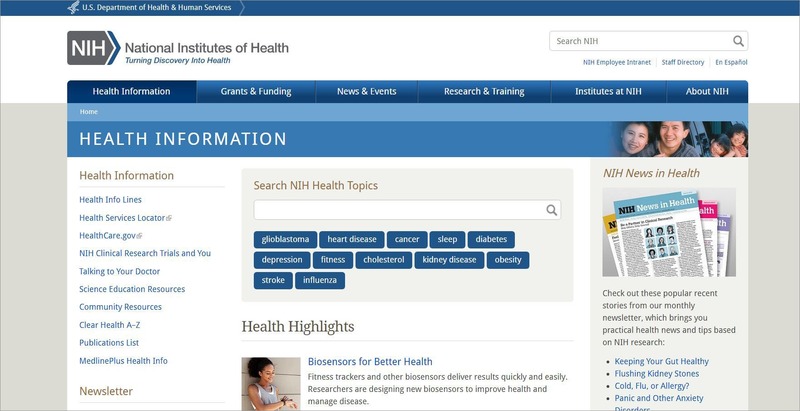 The National Institute of Health is a no-frills official government website that leverages its comprehensive database of health information to develop themed, searchable content collections on specific trending wellness topics. It attracts more than 55 million monthly visitors. The website focuses on providing longer reads and quick links to up-to-the-minute medical research for healthcare consumers seeking a deep dive into the science behind wellness. Cancer symptoms, heart health, and general wellness topics like sleep quality and cholesterol management were trending in 2017, but the website’s most popular sections have to do with consumer education. The website presents a user-friendly catalog of disease-specific information, starting with basic definitions and ending with detailed explanations of alternative treatments. Healthcare consumers aren’t always looking for a quick content fix. Develop a database of long reads that offer a course-level examination of a particular trending wellness topic. That might take the form of a video playlist with a companion ebook or a webinar that allows consumers to ask questions and then access specific downloadable resources based on their topics of interest. These types of marketing content will not only engage your reader on your site, but they’ll also establish you as an expert and leader in your specific healthcare field. Yahoo Health draws 50 million visitors per month to its magazine-style, celebrity-driven page. 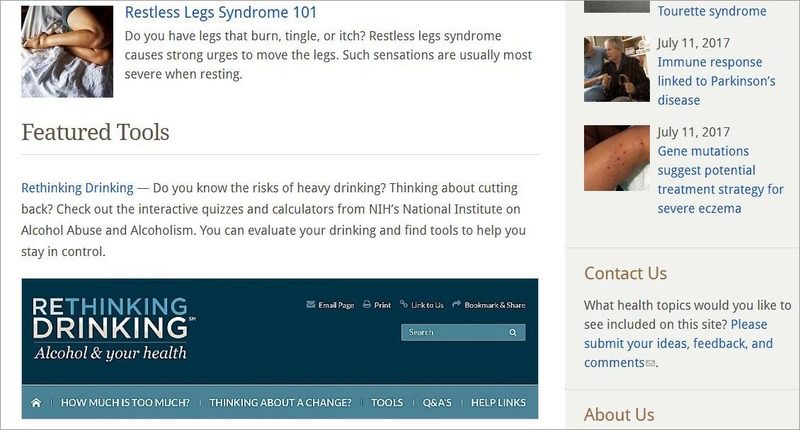 While you won’t find NIH-style expositions of new medical research, you will find a range of multi-sourced content and “debunking” stories focused on fad diets or healthcare myths. 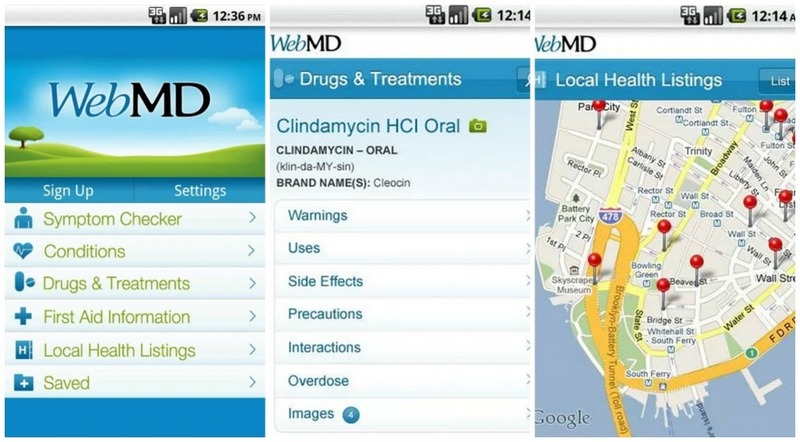 Today’s healthcare consumer wants content that is use-driven, personalizable, and user-friendly. Yahoo News focuses on what every search-savvy consumer wants: a curated collection of top stories that meet their changing needs for featured, long-form, and FAQ content. It’s personalizable (if you login) and allows for segmented searches through beauty, fitness, and other sub-topics across multiple social and media platforms. Trending topics lats year included diet and weight management, heart health, and child safety. Successful content is sharable and not exclusively tied to brand messaging. Don’t shy away from including the development of a curated health information feed in your content strategy. Why? Because healthcare consumers shouldn’t have to leave your site to get breaking health news. You might use a streamlined RSS feed module to showcase headlines or offer a free app that allows your readers to view selected health news—coupled with your own content—on the go. Simply include an easy “return to our site” option that allows you to keep them gently tethered. Today’s wellness-focused news sites garner the attention and loyalty of millions of in-market healthcare consumers. Your healthcare content marketing can benefit from adopting some of their most effective tactics, but you’ll need to keep in mind the importance of user-experience, consumer-data best practices, and a host of other critical considerations. Connect with us for a free consultation, and we’ll develop a strategy that highlights your brand’s message while giving your consumers the kind of insightful, engaging content that they crave. Get in touch us with us today at 973-292-1400. We’re here to help. The answer is an emphatic “yes!” Consumers are turning to podcasts in their downtime as an alternative to other kinds of digital content. For those seeking a healthcare marketing solution to attract millennials or affluent private payers, for example, podcasts are a must-have. According to a recent study by LinkedIn, more than 40% of millennials listen to podcasts, and 44% of C-suite executives do as well. A recent report by Edison Research revealed that about 87 million Americans listen to podcasts every month, with 52% doing so at home. That means that your targeted audience may very likely be in familiar, comfortable surroundings when they encounter your podcast, open to settling in for engrossing, long-play content. Research published in the Journal of Consumer Psychology showed that consumers in a calm, relaxed environment—like their own homes—responded best to ads with stimulating storytelling. This means that when delivered via podcast, patient stories, physician profiles, features about newly acquired medical technology, and other “attention required” types of healthcare content marketing can reach your consumer when they’re the most receptive to brand messaging—and most capable of processing exciting new ideas. Podcasts are by nature immersive for the audience, causing an intense content focus that is comparable to that created by an engaging video. According to a study by neuroscientists from The University of California Berkeley, podcasts are a “whole brain” experience, stimulating neural pathways to the extent that the mental images conjured by the podcast simply overtake present reality for the listener. Testing showed that keywords and concepts introduced during a podcast triggered emotional responses after the podcast ended, as the brain associated the broadcast’s messaging with newly formed thoughts and emotions. What does that mean for marketers? Podcasts are a powerful marketing solution, offering exceptional brand recall, to the tune of 80% according to a recent study by ad tech firm Midroll. A further 61% of consumers surveyed stated that they made a purchase after hearing about a product or service in a podcast. Podcasts are just like any other form of content: You’ll have to market them relentlessly to see results. Podcasts can be embedded in tweets, so add a link when tweeting related static content. Use Instagram and Facebook to build a shareable “behind the scenes” visual story of your most popular podcast episodes, while using infographics to present teasers for topics discussed. Graphics should be stand-alone (“3 Ways to Lower Cholesterol”) with a “Learn More” button that presents a direct link to listen to the podcast. Seed the broadcast or webpage that presents it with tangible reasons to immediately connect with your healthcare system. That may mean that your podcast’s patient story highlights the critical role that a telemedicine app played in helping with a recovery, and then your audience receives a link to download the app upon podcast subscription. It could also entail embedding follow-up episodes on web pages where your audience can access additional information and launch a live chat without leaving the page. Make sure to tether your podcast’s range of topics to the areas within your health system’s expertise, while employing your content as an evergreen call-to-action. That means every survivor story, Q&A, or physician profile should articulate the role that your hospital is ready to play in your audience’s wellness journey: Your brand’s unique abilities to meet patient needs should shine through every post. A Q&A podcast might end with an offer to have general questions answered directly via email after registration, along with a short message on your health system’s commitment to offering personalized, long-term wellness plans. Building a reservoir of engaging, informational podcasts will allow you amplify the strength of your existing static content when they’re presented side-by-side. The focus, always, should be on the immediate value to your audience. But besides helpful information in an engaging format, are you giving them an immediate reason to connect? The answer depends on how well your podcast communicates your brand’s value to your consumer: You may have told your brand’s story, but does your audience envision it as their story as well? We’re here to help. For nearly 20 years, we’ve been helping leading brands craft stories that attract, engage, and inspire audiences to connect. Get in touch with us today for a free consultation 973-292-1400. You not only want to be successful today, but also in the long-run. While this may seem like an obvious goal, it’s not always so easy to get there. But a successful healthcare marketing strategy will take your long-term goal into account and provide sustainable growth that will launch you past your competition. What beliefs unite and drive our health system or hospital? What connects us with the enduring values of the customers we serve? For healthcare marketing to deliver its optimal impact, marketers must be clear about the difference between what they sell and the promise they deliver to their customers. They are not two different sides of the same coin. Given the current forces at play in healthcare—consolidations showing no signs of slowing, consumers increasingly calling the shots, competitors re-drawing boundary lines, new technology enabling new business models, etc.—identifying and being guided by a higher-order North-Star strategy is the only sure way to meaningfully connect to customers, stay ahead of competitors, and drive long-term success. Any business is only as strong as its brand, which we define as what a business is all about in the hearts and minds of the people it serves. It’s the one company asset that evokes interest, drives margin, builds a reputation, and locks in loyalty. In healthcare, while functional benefits like the latest technology, service excellence, and easier access might boost volume in the short-term, they’re me-too promises that don’t convey value or distinction. If your goal is to build a brand that excites and engages customers, you need to differentiate. If your goal is to create a brand that people believe in, you need to differentiate. If your goal is to grow, you need to differentiate. What customers desire has everything to do with them, and very little to do with you. Because your brand is a tool to make their life, and their world, better. The brands that deliver this kind of value, each in their own way, will win. When we look at the broader brand realm—to consider possibilities beyond our direct healthcare competitors—it becomes obvious that brands who deeply understand themselves and deeply understand their customers are most successful. How do they each uniquely improve lives? For Airbnb, it’s freedom. Apple, empowering creative individuals. Dove, celebrating every woman’s unique beauty. FedEx, peace of mind. IBM, helping build a smarter planet. Mastercard, making dreams come true. Uber, a personal concierge. Zappos, happiness through “wow” service. Future success is predicated upon how your organization uniquely adds value to improve lives. This starts with a clear definition of the relentless quest (North-Star strategy) of your healthcare organization— in ways that shouldn’t be confused with your competitors. Otherwise, you put yourself on the same playing field. Establishing this brand foundation opens up unlimited possibilities, knows no business model boundaries, and has no expiration date. There’s a wonderful book written by Jim Stengel, former P&G global marketing officer from 2001-2008, called Grow. In it, he cites his own research conducted (a 10-year growth study of 50,000 brands referred to as The Stengel Study Of Business Growth), which thoroughly examines the interrelationships of people’s bonding with brands and the growth in those brands’ financial value. His research revealed that the 50 highest-performing businesses are the ones driven by brand ideals; that “The Stengel 50” grew three times faster than their competitors; and that an investment in “The Stengel 50” would have been 400% more profitable than an investment in the S&P 500. Proof of the study is irrefutable: The shared agenda of your brand and your customers are the ultimate driver of category-leading growth. We’re fortunate to have a long-standing relationship with a client who exemplifies being driven by a North-Star strategy. And it’s reaping the rewards. Tower Health, formerly Reading Health System, lives by its North-Star strategy of “advancing health and transforming lives.” Everything the organization does is filtered through this idea, and it opens up unlimited possibilities. According to Lisa Hess, vice president of marketing and communications at Tower Health, “When business strategy and brand strategy are aligned and informed by a higher ideal, it’s difficult to stop an organization’s momentum. This is absolutely the case at Tower Health. We’re aligned by and with our North-Star —advancing health and transforming lives. This drives our decision making, unites those across our organization and drives our culture. It’s a key driver for our success.. If you’re looking to deliver sustainable business results, you have to stand for something compelling and enduring. Something that cuts through the noise, clarifies what you and your people stand for and believe, and improves lives. Your North-Star strategy is your starting point. But your North-Star strategy isn’t the only one you need to concentrate on. Developing a successful healthcare marketing strategy requires utilizing all of these goals—becoming fresh and relevant, defining yourself as a momentum brand, understanding the websites your customers are reading, developing engaging podcasts, and sustaining your growth for the long-term. It’s through a multi-pronged marketing approach that will enable you to leave your competitors behind. For more than 20 years, we’ve been combining our understanding of the healthcare industry with a fresh perspective in order to find new growth for your business, engage your customers more deeply, and make you stand out from the crowd. If you’re ready to create your own healthcare marketing strategy, reach out to John Weber at 973-298-0511 for a conversation on how we can make you successful in 2018.